Father and son team Jeff and Josh Duda have built a modern-day pool hall for all Bendites. 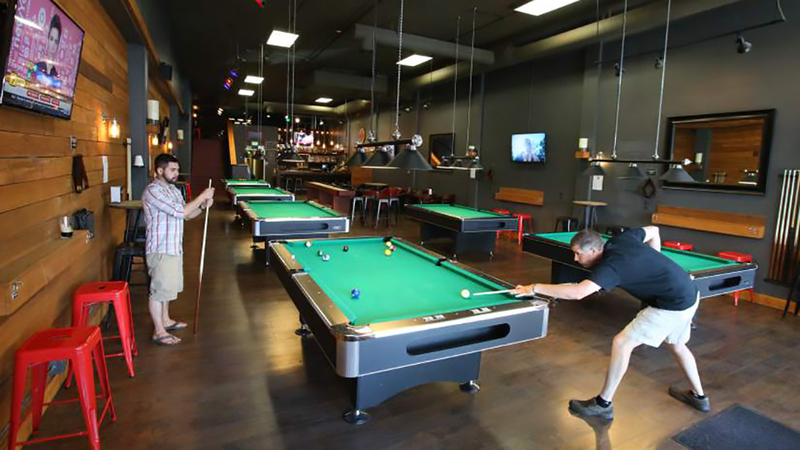 Their goal was to create Bend’s premier pool, billiards and game destination, and with six full 8-foot tables and two 7-foot tables played by the hour and first-come, first-served shuffleboard, foosball and darts, they’ve accomplished their mission. The full bar has a whiskey selection that rival any bar in town, 8 popular beers on tap and an impressive selection of canned/bottled beers and ciders that shouldn’t be missed. The newly introduced Aussie Pie Shop serves up a variety of freshly baked Australian meat pies. From The Classic beef pie to our signature Ned Kelly, you’ll love the unique flavors and the flaky, buttery pastry top! In the heart of downtown Bend, Duda’s offers a fun, friendly and relaxed environment where pool sharks and non-players alike can enjoy a fun night out on the town. Minors are allowed every day until 8:00 p.m.